She is a superstar singer who is gearing up for the launch of her Caution World Tour next month after a flurry of Christmas concerts. And Mariah Carey enjoyed some downtime before her tour kicks off as she soaked up the sun in St Barts with beau Bryan Tanaka and children Moroccan and Monroe on Thursday. 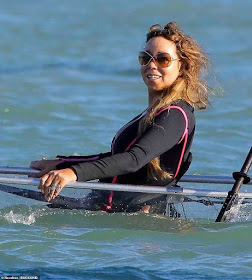 The Heartbreaker singer, 48, showed off her sensational toned frame in a plunging black wetsuit with pink trim, which flashed her ample cleavage as she posed up in the surf and enjoyed a boat ride with her kids and Bryan. The racy wetsuit clung to the mother-of-two's slender midriff and tiny waist which showcasing her peachy posterior. Back-up dancer Bryan showed off his hunky shirtless and tattooed physique in a pair of navy swimming trunks, adding a cool edge by donning a powder blue cap. Twins Monroe and Moroccan, who Mariah shares with ex-husband Nick Cannon looked adorable as they snorkelled, with Monroe wearing a fuschia pink life jacket.